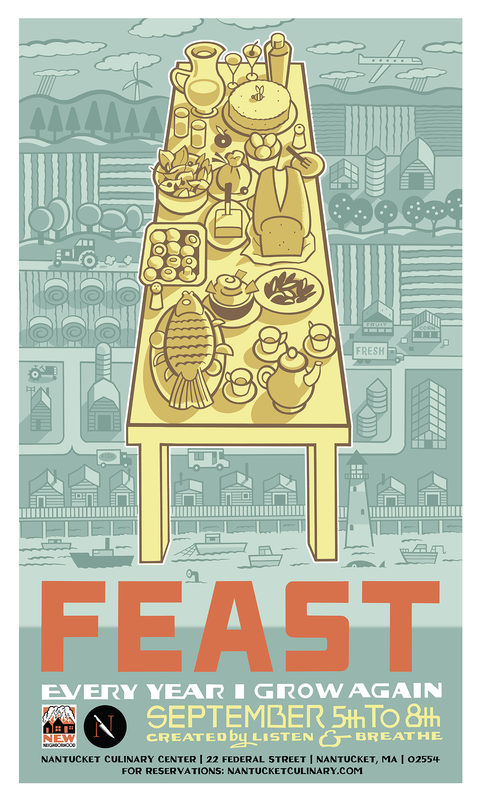 In conjunction with the world premiere of Evanston Salt Costs Climbing at White Heron Theatre Company, New Neighborhood will launch FEAST: Every Year I Grow Again, an interactive dining experience created by Listen&Breathe, at Nantucket Culinary Center, in association with Nantucket Culinary, Sustainable Nantucket and the producers of Nantucket Island. Hungry to know where your food comes from? FEAST: Every Year I Grow Again is an interactive dining experience celebrating the September harvest at Nantucket Culinary Centre. Audience members take a multi-sensory journey through a meal cooked by Nantucket chef Greg Margolis and taste the story of what’s growing, guided by the voices of the farmers, fishers, foragers, brewers, and beekeepers behind the food. Listen&Breathe is a group of artists who build multi-sensory site-specific experiences that challenge how we interact with each other and our environment. Created by Tyler Kieffer, Nicholas Hussong, and Hugh Farrell, Listen&Breathe develops and presents work in Europe and America. Their first project, Every morning I wake and seem to forget…, premiered at Body&Soul Festival in 2015 and was further developed at Another Love Story in 2016 and 2017, and Clonmel Junction Festival, 2018. September 5-8, 2018, 8PM: each seating is limited to 12 audience members. Tickets are $125 each and are available by phone (508) 228-COOK (2665). The complete schedule is available here.